This week on Elite Advisor Blueprint, Steve Sanduski shares his journey as an elite financial advising coach and provides deep insight into where the industry is headed! 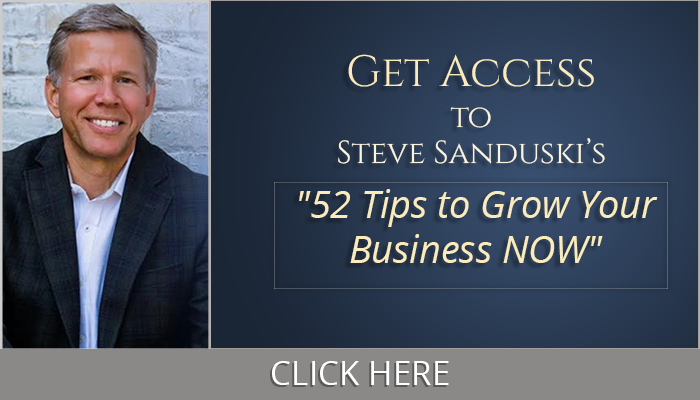 Steve Sanduski has had over 20 years of experience growing companies by multiples, including one whose revenue grew 17-fold during his leadership. Steve helped launch and build a $1.8 billion RIA and was the Managing Partner of Peak Advisor Alliance as it grew from 0 to 1,000 coaching clients. Steve has led countless speaking engagements with top advisors and has spoken to audiences all over the country through keynotes, breakout sessions, and day-long training programs. He’s a New York Times Bestselling author and the co-author of Tested in the Trenches: A 9-Step Plan for Success as a New-Era Advisor and Avalanche: The 9 Principles for uncovering True Wealth. Steve also interview’s top leaders at the intersection of business, investing, and life on his podcast Between Now and Success. His guests include visionary leaders such as Tony Robbins, Ric Edelman, Marty Bicknell, Peter Mallouk, Elliot Weissbluth, Jud Bergman, David Bach, Jon Stein, Steve Lockshin, Carl Richards, Michael Port, Michael Schrage, Aaron Klein, Chip Roame, and Scott Hanson and many more! Then we get into the most powerful lessons and takeaways from some of Steve’s former podcast guests like Tony Robbins and Hightower Investment’s Elliot Weissbluth, you won’t want to miss these! [03:50] Steve shares his early days in the financial advising game and how a partnership with Ron Carson led to the launch of Peak Advisor Alliance – An Elite Financial Advisor Coaching business that’s been around since the 90’s. [12:05] Find out how Ron Carson discovered the habits of top achievers, connected with the most successful people in the world, and landed his first billionaire client. [15:15] Why differentiating yourself and clearly defining your target audience is critical if you want to succeed as a financial advisor. [22:40] How to avoid losing business to robo advisors while creating the best possible life for your clients. [00:27:35] Why using technology to increase efficiency should never come at the expense of your clients experience. [30:34] The unique human attributes that technology can’t compete with and how you can use these to create a sustainable advantage. [34:42] The pros and cons to working with clients remotely. [39:12] Find out why Steve started his podcast Between Now and Success. [44:04] The most memorable moments from Steve’s podcast guests, such as Tony Robbins and Elliot Weissbluth. [53:50] Why the more valuable you are to the business, the less valuable the business is. [54:16] Why the growth of your business relies on your ability to surround yourself with incredible people. [56:02 Steve’s advice on hiring new talent and knowing when to let people go. [01:02:12] Why Steve’s Dad is the first person he thinks of when he hears the word “successful”. [01:05:05] The book that Steve believes all financial advisors should read. [1:06:41] How small acts of kindness can make a big difference in the world. [01:11:28] The one piece of advice Steve would give to any financial advisor that wants to succeed. Dan Sullivan – Founder and President of The Strategic Coach Inc.
[00:00:50] Brad: In this episode I talked with Steve Sanduski and for any of you who have been on the financial services industry for any amount of time, his name should be a familiar one. Steve has been a pioneer and alongside Ron Carson helped launched a multi-billion dollar RIA firm. He then co-founded Peak Advisor Alliance and also co-authored Tested in the Trenches and Avalanche. Books both written helped financial advisors design their ideal practice. Most recently, Steve’s launched his own consulting firm, Belay Advisor and also host the popular podcast Between Now and Success with former guest that include guys like Tony Robbins, Ric Edelman and David Bach. Also, massive RIA’s like Joe Duran, Marty Bicknell and Elliot Weissbluth. Here’s a quick overview of what we cover in this conversation. We begin with a history of how Steve and Ron originally connected and then later launched Peak Advisor Alliance from a conversation that began in Ron’s basement. From there, we get into what creates an imaginary glass ceiling for financial advisors’ that actually holds them back from the growth they want to achieve. Later on, we dig dip on the massive changes in Fintech and how Steve sees our industry evolving away from return on investment in more to return on something else that’s much more impactful to your clients. Then we get into the most powerful lessons and takeaways from some of Steve’s former podcast guest. People like Tony Robbins and HighTower Investments, Elliot Weissbluth. You won’t wanna miss this. [00:01:59] Brad We wrap with one of my favorite parts of the conversation. Steve and I discussed the power of random acts of kindness and the power they have to change not only your own perspective but the perspective of those around you as well. One last thing before we get to the conversation. Steve made a free gift available to all of you Blueprint listeners. His tool, 52 Tips To Grow Your Business Now. Don’t miss tip number 17, we actually cover this during our conversation and this is something that’s benefited both Steve and I tremendously. This tool is available at bradleyjohnson.com/19 or in most mobile podcast players by swiping to the show notes and clicking our link at the top. As always, you can find links to books mentioned, people discussed, a full transcript of the show, everything else in our show notes there as well. Thanks for listening and without further delay, my conversation with Steve Sanduski. [00:02:51] Brad: Welcome, everyone to this episode of The Elite Advisor Blueprint podcast. I’m excited to have Steve Sanduski with us here on this week’s episode. Welcome, Steve to the show. [00:03:00] Steve Sanduski: Hey, thanks Brad. Glad to be here. [00:03:03] Brad: I wanna start… what’s really fun on my show is a lot of times I get a tieback to either previous guys that have been on the show or I like to think I’m not that old but I’ve been doing this now close to a decade so I guess I’m starting to get up there and it’s very cool to have you on the show because you were actually a speaker at one of Advisors Excel very first events. I got to actually see from stage and so it’s fun now to be able to talk face to face and have you share what you’ve been doing to help financial advisors all across the country for quite awhile now. [00:03:37] Steve: Yeah. This is a small business when you really think about it and I’ve been around a few more years than you have. Got a few more gray hairs I think that you do as well but yeah, it’s always good to catch up like this. [00:03:45] Brad: Cool. So let’s just dive right in. There’s so much I wanna ask you about. As we get started though for those that aren’t familiar with you and really your history. I mean I really look at you as a groundbreaker in the financial services industry. You and Ron Carson were writing books before it was cool to write books, as a financial advisor. So before it was mainstream, right. I would just love to hear a little bit of your story, really, how you got to the point and then maybe how you evolved, maybe take us to the point where you wrote the first book with Ron and what got you to that point, if you don’t mind sharing. [00:04:22] Steve: Okay. I think maybe the best way to answer that would be to just really go back in time. Go back to the 1970s. When I was growing up, I grew up in Omaha, Nebraska and my dad although he was never in the financial services business was always interested in stocks. He had been an investor for over sixty years. In the mid to late 1970s growing up there in Omaha, we’d have dinner at basically the same time every night and the radio would be on the KFAB radio, AM radio and at the same time every night like 5:20 PM there would be a one-minute segment. They call it, the market minute and some financial advisor would sponsor that and they’d come on, they’d say, “Here’s what the stocks are doing. Here’s what the Dow Jones did. Every night, I’d be hearing what’s going on in the stock market and my dad and I would always just kinda be talking about the markets cause that was something between he and I. And then in about 1978, I was a sophomore in high school, I had saved $2000 from various paper routes and different activities and I went to my dad and say, “Hey dad, I’d love to do something with this.” And he said, “Well, you should invest it.” Then he said, “Well, what should I invest it in.” And the said, “Standard Oil of Indiana.” And I had no clue whether that was a good or bad idea. And so I decided, sure. I took a $1000 and just to show you what the technology was like back then, in order to buy the stock. I didn’t want to go through a broker and so the way to do that was through their dividend reinvestment program. I wrote a check for $1000 mailed it off to the registrar. [00:06:02] And then about like once a month or once a quarter, the registrar would go in and they would buy all of the dividend reinvestment things and then like a month or two months later, I got a letter in the mail saying, you are now the proud owner of like twelve and a half shares of Standard Oil of Indiana at 80 ⅞. Of course, this was before we moved to..we were still with the fractions there for stock prices. Anyways, I got lucky and so I bought this stock and it almost tripled in the next three years. So I basically got beginner’s luck and so that was really kind of the genesis of my interest in the business. It kinda took me awhile before I ultimately got into this industry. So I went to college, worked for Caterpillar for a few years, went to grad school, got an MBA. I thought that was gonna be my ticket to get it into the industry, took a detour onto Silicon Valley for a little while with Hewlett Packard and then eventually wound my way back to Omaha and ended up getting a job in this industry back in the early 1990s with Securities America. So that was really how I got to start, spent most of the 90s with Securities America and then in the early 2000s, Ron Carson and I got together, we’ve been neighbors, went to the same church, kids went to the same school so we connected through our kids. He and I got together one Saturday morning in his basement at his house and just kind of caught up on what each of us were doing and long story short we decided to launch a coaching business and that was back in what about May of 2001 and then that fall we officially launched the program and went great and did that for 11 years. In about 2005 is when we wrote the first book, Tested in the Trenches and then came out with the second book called, Avalanche in about 2008. [00:07:55] Brad: Very cool. So you were both advisors because Ron was at Securities America as well, correct at that time? [00:07:58] Steve: No. So Ron got his start in the industry basically cold calling out of college and that was so successful, he decided to do it full-time. I think his first broker dealer actually was Securities America but long story short he ended up having to leave there and went to LPL and so by the time he and I got connected he was not at Securities America when I was there. At the time, he and I got connected he was with LPL in 2001. I’ve been a certified financial planner since what 1996 but my role in the business has really been on the broker dealer side and then working closely with Ron for about 11 years building up the coaching side of the business. [00:08:40] Brad: I’m assuming the coaching service you’re referencing is Peak. [00:08:45] Brad: Okay. So really Peak was hatched in Ron’s basement, the two of you put your heads together and “hey, we think we can help some people by sharing some frameworks that we’ve had success with. Was that really that simple or was there more to it than that? [00:08:57] Steve: Ron had started a company, I don’t know what the original name was, it might have been Carson Productions. I think he started that I wanna say maybe in what 1993, actually I think it was. People, the advisors had been coming to him because he was pretty successful even back in those early days and they wanted to learn what he did that made him so successful so he put together a once-a-year workshop where he would invite people to come to Omaha, spend a day with him and he would share some of his best practices. So he did that from basically 1993 until 2001 and he also did speak in engagements and some consulting work. So when he and I got together, we basically brainstormed and said, “Well look obviously you’re very successful as an advisor and I love kind of building the business, I love the coaching piece, I was doing a lot of that in my days at Securities America” and so we decided, “Well, let’s make this a year round thing. Let’s set up a coaching service where we charge a monthly fee and in return for that we’ll provide you with ongoing coaching” and so that was really the genesis of it was to take a lot of the things that Ron had been doing to be successful and then how can we repackage that into an actual system and codify it into best practices and deliver tools like “Ghost Written Weekly Market Commentaries” and “Marketing PowerPoint Presentations” and so it was the coaching piece and it was the tools piece, systems manuals, those sorts of things and put it in an organized fashion that made sense and then go out and deliver that so that’s what we launched there in the fall of 2001. [00:10:53] Brad: I think today… I mean you look “Google Mastermind” then you’ll go for pages on all the masterminds available even in the financial advisors space right? There is a number of different groups and coaching services available today. Was that groundbreaking at the time or did you take your inspiration from other places? [00:10:46] Steve: Well I think, what was available back then was the “Strategic Coach Program” Dan Sullivan’s Program was certainly going back then but I don’t think it was anything near what their program is today. So yeah I would definitely say that what we built at Peak back then was I would say pretty much on the cutting edge and of course we had the internet was around then. I was still relatively new back then but we definitely built a website, we did a lot of audio works so what you and I are doing here today we didn’t have podcast back then, we didn’t have YouTube back then but we did a lot of audio works so we did monthly conference calls, we’d record those, we did twice a year meetings which were called Excel meetings like Advisor Excel. [00:11:30] Brad: There you go. [00:11:31] Steve: And we’d record those sessions and gosh I remember back in those early days I was the audio editor so I’d take those sessions and I’d fire up the software and I’d actually do the audio editing as well so of course as you know starting a company, you’re a jack of all trades, you wear all the different hats and what’s good about that is you really learn how to do the stuff and so I’m pretty far removed from that today but knowing how to do that stuff and how it works it makes it easier for you to be able to train and teach other people how to do it and really know how all the pieces fit together. [00:12:05] Brad: I’m curious now because Ron shared in our conversation… it was this little nugget that I thought was gold and it was this concept of this audio program he used to do back in the day called “Habits of Top Achievers” I believe was the name of it? Was that an idea that kind of came out of the Peak group or was he doing that prior or were you involved in the audio editing? [00:12:27] Steve: “The 15 Habits of Top Achievers” yes I was the audio engineer. [00:12:33] Brad: There you go. [00:12:34] Steve: Put in multiple tracks in there and put it in the audios sounds, the music soundtrack underneath and everything. So I don’t remember if he kind of came up with that idea prior to Peak or whether that was something during Peak. That was definitely during the early days and he looked at all the people that were mentors to him and people that he looked up to and tried to identify what are some of the commonalities among these top achievers and he came up with 15 of them, we recorded an audio of that. I think he turned it into a paid-speaking topic as well. [00:13:06] Brad: So for those advisors that are obviously listening out there or watching. One thing I took from… it’s funny because I started this podcast and one of the things honestly no different than having you on here Steve, I’d love to just pick your brain. You’re the guy that’s been incredibly successful in this industry and for me, I enjoy these conversations hopefully just as much as anybody else listening in and something I took from that conversation with Ron he landed his first billionaire client because of “Habits of Top Achievers” because he was asking them to come on the show to where he could just pick their brain and they could talk about themselves and share some habits that lead to their success which who doesn’t love talking about themselves right? [00:13:45] Brad: And what you don’t realize is that was a way for him to get side by side with some other top achievers that could be potential A+ clients. So I think it was kind of hand in hand it was value proposition but was that part of the strategy as well or these are 15 people that I would love to connect with that could be A+ clients. [00:14:02] Steve: Yeah, I don’t know how premeditated it was for him but he is like I am sure you are, we are just continuous learners and we just love to talk to other successful people figure out what makes them successful. That was one of the reasons why I started my podcast more than two years ago was I really wanted to have an opportunity to talk to some of the most successful people out there whether it’s people in the financial services industry or authors or professors, other people who really had something interesting to say that could be helpful to financial advisors and so I love to learn and so I thought, well gosh, a podcast would be the best way to do that, have an opportunity to talk to people and really share some information so… I could look at the work that I do today and a lot of my business has come from my podcast whether it’s clients or guests that I’ve had had on the show that have turned into clients or people that have listened to the podcast and have reached out to me and say, “hey can you do that for me too?” kind of things so it’s been a great win all around having the podcast. [00:15:08] Brad: Awesome. And we’re going to get into the podcast because you’ve had some incredible guest so I’m going to save that a little further down. I want to ask you… so from a coaching perspective you’ve had this 30,000 foot view of the industry for quite a while now and Ron Carson is one of the most successful obviously you’re sitting shotgun with him along for a lot of that ride right? As well as number of large RIAs that I know that you work with. If you could just distill down and I’m going to ask these two ways because I think there’s the advisor that’s in the world of trying to transition into running a business like a CEO, they’re kind of more of the sales guy that’s transitioning to try to be the CEO and then you’ve got some ultra-high performing RIAs that are really kind of the rainmaker and their model or really the face of the brand. I guess if you could speak to both of those groups because I know we have both of those types of groups listening in. What is the one thing like if you just had to put your finger on it, it has gotten the way or held those individuals back from success or kind of put the glass ceiling on them. What are some common themes you see from a coaching standpoint that have gotten in the way. [00:16:09] Steve: Well I’d say a couple things, one is, you’ve got to figure out what it is that you really want and I’ll give you an example I’ve got an advisor that I coach and as we were early on in the coaching relationship his objective was he wanted to grow to a certain level and that was really important to him and as we continue through the coaching it became clearer that there were things getting in the way of hitting what that growth level was. Long story short what we finally realized was the idea of trying to be at a certain production level was more intoxicating than the reality of wanting to do the work that was necessary to get there. It’s not that this person was not a hard worker it’s just that’s not really what they ultimately wanted to do. What they really wanted to do was be a great financial advisor. They got into business because they loved working with people, they loved working with higher net-worth people and solving their complicated issues as opposed to wanting to build a mega million dollar RIA and be the CEO and have to deal with all the people issues so ultimately what we ended up doing was they’re merging selling to a larger entity and so they can spend more of their time focused on working with the clients as opposed to running the business so I think that’s one thing is just getting clear on what do you want out of the business? Do you want to be the CEO? Or do you just want to be a great advisor? And maybe you still want to build a big business but you don’t want to be the CEO and if that’s the case then you need to hire some other professional management so I’d say that’s one thing is really getting clear on where do you want to be in your business and then a second thing I’d say is just a lack of clarity in general meaning what is the specific value that you provide as a financial advisor. There’s been forever we talk about in this industry, you differentiate yourself. [00:18:09] And I gave a talk not long ago and it was somewhat on the topic of a podcast guest that I had who wrote a book called “Why Should I Choose You?” so I’ve got three financial advisors to go up on the stage, I had three bar stools there and I walked them through an exercise trying to help them describe what differentiates themselves from other advisors then I had some specific questions that I walked them through. By the end of the presentation, it was fairly hard to distinguish the difference between these three firms and so I think that is an issue that financial advisors continue to struggle with and I think it’s so important and I think it’s becoming more important as time goes on we get Robo-Advisors and those sorts of things to have what I would call “extreme clarity” on what is it that you do, what is the value that you uniquely can provide, who is your specific target audience. It’s not this spray and pray idea, it’s like give me the client persona here, give me the specific demographics, psychographics, likes, dislikes of your target audience then you can create all of your marketing around that specific audience so that when you send the marketing message out there the person on the receiving end is gonna raise their hand and say, “you’re talking to me, that’s exactly what I’m facing I need to contact you” or they look at that and say, “that’s not what I’m looking for” so you want to repeal some people but you also want to attract others and so your market is going to be able to do both of those. [00:19:44] Brad: That’s awesome advice. Actually I grabbed some notes here from one of the first books I ever read when I got in this industry and it was “Tested in the Trenches” that you co-authored with Ron probably started around that basement conversation or maybe a few years later, but step number one: gain personal and professional clarity through the blueprinting process right? [00:20:02] Brad: So where do you actually want to go? Where are we going? And then where are we at? Goes to building your brand is kind of what you spoke to with the process. Dan Sullivan, strategic coach, we’ve mentioned already in this conversation they call it, the unique naming guide, and as we know most financial advisors a lot of the planning they do overlaps, a lot of its similar, income planning, wealth accumulation, tax planning, estate planning, having some sort of plan that ties that all together for their clients. So have it actually saying this is our proprietary process, it’s the XYZ blueprint specific to our firm which I believe is a lot of what you’re talking about there. How do I take the process that we do for our clients and differentiate it from everybody else all the other offices lining the street here in our area? [00:20:50] Brad: But there are more to it than that. Do you have specific things that you guys have done to really start to expand or I guess well you’re from Omaha so I can use a Warren Buffett reference right? Start to build the moat around your castle… Are there other things that you guys have done there? [00:22:56] I mean that is not going to ultimately keep a client. What’s going to keep a client is helping them figure out “how can I get the best life possible with the money I have?” and so we think that’s where financial advisors can really add value that is not going to be overtaken by anything that a computer can do. It’s the financial advisor having that conversation, helping you in that discovery process to help the client truly understand what’s important to them? What do they want out of their life, in all aspects of their lives and how can they use their money to get that best life possible? How can they make the best decisions possible with the money that they have? As supposed to how can I maximize the pot of gold that I have here? [00:23:40] Brad: That’s awesome stuff right there. I completely get that. I mean that’s what people want anyway right? I mean the reason you go to work for 30 or 40 years and build up this nest egg is you actually want to use this stuff someday, this pile of money to create life experiences you wanted to have. Do you have some examples of advisors that have started to go down this path? Maybe some things they have done in their process or some different things you may have helped coached them on that have started to go down this path of Return on Life? [00:24:10] Steve: Yeah. What Mitch and I have done up to this point is we’ve created a program that we called the “retirement coaching program” and so to us that’s really a subset of this whole Return on Life concept so I look at Return on Life as the umbrella and under that there is different components one of which is retirement coaching and so we’ve taken a bunch of financial advisors through that process and the idea’s that the whole concept of retirement is changing and has been changing for quite some time and retirement’s probably not even the right word anymore but we haven’t really come up with a better word that people would really kind of accept and understand but the idea is that when you combine this with people are living longer and again speaking of the podcast I had a guy on the show, he’s a professor at London Business School and he wrote a book called or co-authored a book called “The 100-Year Life” so I wanted to get him on the show to talk about life expectancy and as people are living longer, how is that going to change the dynamics of living? How is that going to change the dynamics of human relationships? What happens when we have four generations of the same family living in close proximity to each other? And it’s not like my dad, he’s 87 years old and knock on wood, he’s still going strong as well as my mom both up there in Omaha and I look at his career and he was in the service for awhile and then he got out and he worked for Union Pacific for a little bit and then he went to work for Western Electric and he spend about 30 years there and retired when he was in his late 50’s and when he retired he never “worked” another day in his life and he followed the stock market and so he had things to keep him interested. [00:25:56] But I don’t think that’s how most people are going to retire in the future particularly if we’re living to 80, 90, a hundred years of age. We’re going to have multiple careers and we’re going to have to go back to school at different points in time and so I think that is a real area for financial advisors is to really school themselves in the area of helping clients retire better. I’ll give you another example, I was having a conversation with the woman here recently in the Milwaukee area and she works for a large insurance company here, The Quiet Company, I think they call them and her financial advisor is with this company and she’s just getting ready to retire and so she went to her advisor and said, “hey, what advice do you have for me now that I’m going to be retiring in terms of how to really make the most out of my time in retirement?” and he looked at her and he said, “well, that’s really not my area of expertise so my focus is on helping you make sure that you’ve got the money that you need in retirement and that you’ve got the protection products that you need and so that’s really not what I can help you with” and I looked at her and said, “I can’t believe that” I mean in this… to me that’s the kind of advisor that’s going to be a dinosaur I mean that’s a commodity advisor, someone who could really add value, someone who could really have some meaningful conversations with her and her husband about what life is like in retirement and that’s really what Mitch and I had created was a training program to help financial advisors’ facilitate those kind of conversations between a couple that are nearing retirement or in retirement so that they can really maximize their time in retirement and not just focus on the money piece. [00:28:23] Steve: Yeah, now here’s the funny thing about that example that you just gave. So travel agents and because of technology, a lot of them have gone out of business but you gave the example of a really complicated travel situation where travel agents still add tremendous value so I think the analogy there works with the financial advisor those that really can handle the complicated situations, I think that’s good. But here’s the ironic thing, the technology has simply transferred the work of what a travel agent used to do to look online to the saber system and figure out what your best connections are. We’ve just taken that and we’ve made that retail. So now you and I are sitting on the computer and were looking that up so we’re doing the work that the travel agent used to do and that’s the thing that I think our industry needs to watch out for as well, meaning increasing your efficiency should not be at the expense of you clients meaning, don’t take something that you used to do in your office like data input and say, “I’m now going to make my clients do all of that because I’ve got this online data input thing so here’s the link, now you go and you type in all your stuff or you link your accounts okay?” I see so many people doing that and that is not increasing your efficiency. That’s just making the experience worse for your clients so I think we have to be really careful when we think about technology and making sure that it’s enhancing the client experience and not just simply transferring the work from my office off to the client. Now that example that I just gave you, some clients might like the control or the ability to kind of enter and let you see what I want you to see, I get that, but I think we just have to be very careful and think about what this technology whether it’s really enhancing the client experience or whether it’s just making our lives easier. [00:30:13] Brad: I love that. I never thought about it from that standpoint. You’re spot on and the other thing you’re doing well if it gets that easy to do for the client you’re making yourself replaceable as well right? So go to the betterments of the world, “why am I paying this guy a percent over here anymore?” You know 25 days as points sounds better over here. [00:32:12] Brad: Yeah that’s scary. So we’re on the topic of technology, let’s just stay there for a second. The Wayne Gretzky quote that gets overused but I’m gonna use it because it’s the best one I can think of, where do advisors need to be skating to as far as that puck? If they’re skating to where it’s’ going as opposed to where actually is right now from a technology perspective in your opinion. [00:32:30] Steve: Well here’s the thing that I think advisors need to really be concerned about and that is… my opinion is you’re not going to gain a sustainable advantage in this business by being on the bleeding edge of technology. To me, technology is table stakes, I think about back in the mid-980s when I wanted to get on Wall Street and if you think about what was going on in the 1980s the pool market had just started back in 1982, it was the era of Reagan and the movie Wall Street, it was big, I thought, okay, i got to get an MBA. So to me that was kind of the table stakes to get to Wall Street so I went and got an MBA and ultimately I did end up going in to the financial business right out of school from there but I think of technology today as the same way in that we need to have technology but I don’t think that most financial advisors are going to differentiate themselves by their level of technology. I think you need to keep up and there may be some forward thinking advisory firms. Whether it’s the betterments whose business is really built on technology I mean their technology companies I think first and foremost rather than investment companies, they’re technology companies who just happen to do investing where as financial advisors or financial advisory firms who use technology. So I wouldn’t get too caught up in feeling like I’ve got a beyond the bleeding edge of where technology is going and I got to get there first. And even if you are smart enough to identify what that next piece of technology is that’s gonna be the big thing. First of all, you’re gonna be very lucky to hit that. Second of all even even if you are lucky and hit it, it’s just gonna be a temporary advantage because then the rest of the industry is gonna catch up with you so you might get some kind of marginal time advantage but I don’t think it’s really gonna be a sustainable advantage. I think if you keep up with the technology and not get too concerned about trying to predict the technology, I think you’re still gonna be fine. [00:34:31] Brad: Going back to what you said previously, you talked about a client’s centric approach by going back to “is it easier for me to delegate all the data entry to my client?” yes, but it makes their life harder right? Where I start to see technology and may be where advisors are missing the boat a little bit I mean look how we’re conducting this interview right now? It’s a Zoom video conference right? And sometimes I feel like in financial services, we just do things a certain way because that’s how they’ve always been done. Not necessarily that’s it’s best way to do it, it’s just… that’s how I was coached back in 1982 when the bull market was booming. So Alan Moore who I think you’ve actually had on your podcast as well. He just shared when he kind of really set up a virtual office and I think it was kind of a necessity for him where he had to literally move states. He took his clients to a virtual appointment process something like what we’re doing right now and his clients actually liked it more because they didn’t have to drive across town. It’s an inconvenience if I have to take an extra-long lunch for a dentist appointment or a financial advisor appointment where it’s kind of cool if I can just pop up the screen and we can get the same thing accomplish here today. So would you say, which I know that that’s not an edge that they can keep forever because as soon as one advisor does it now everybody’s going to start doing Zoom virtual appointments but is that something where if we look at technology through that light, how can I make my process more convenient for my clients so it better serves them. Do you think that that’s how advisors should be viewing technology or is it more the systemization of process in their own office? [00:36:03] Steve: Well, a couple thoughts there. So one is, as you think about technology and I had a guy named Michael Schrage on my podcast who is a real deep technical thinker at MIT Technology Lab and he said the way that he looks at technology at least as he relays to financial advisors. He said, “think of it in three different ways. One way is you can use technology to automate so obviously as the name implies you’re taken an existing manual process you using technology to automate it. Second thing is you can use technology to augment and so that’s the idea of the bionic advisor that’s using technology to enhance the capabilities of a human and then the third thing that you can do is you can use technology to personalize and segment your clients and basically taking all the data so “big data” obviously is another term that is popular these days but using technology to segment and personalize that data that you can then communicate back to your clients and find out some of the nuances about each of your clients and be able to target specific messages or get alerts that pop up based on certain things happening and so you can do a better job of personalizing your service to them. So I think those are all very good uses of technology. The second thing is related to what Alan was describing there in terms of doing that video conference like you and I are doing I think that gets back to two things. One is, “what’s your business model?” and then the second thing is “who’s your target market?” so you can have a business model like Robo-Advisors where we are a technology based provider, we don’t really have human advisors although betterment for example is kind of moving into that area but their business model is a highly scalable technology platform, low cost, automated investing. That’s their business model and it’s based on technology. Someone like Alan and a lot of these young millennial financial advisors, they’re trying to target people just like them who grew up on technology, who are comfortable with a video-type relationship like this, who are used to talking to people and communicating with people over their phone through text messages so that’s what they’re comfortable with and for the most part they don’t have a lot of money either. It’s not high stakes and so having a conversation like this with someone that you’ve never met in person, yeah that probably works. For those folks, I think the big question now is going to become when these people have a million, two million, five million, 10 million dollars. They win the lottery. Now they’ve got some serious money. Are they gonna wanna be having conversations like this talking about big dollars and personal things or a spouse dies. Do you want to be having a conversation with your client purely remote like this when their spouse just died and they’re trying to figure out what they need to do so I mean those I think are questions that still have to be answered. Again, one is kind of your business model and the second is who your target audience is and whether you want to work with them in the way that’s going to best fit with them. I think those are the two key things you need to think about there. [00:39:12] Brad: Let’s segue into the podcast. We’ve brought it up a couple times. Let’s dig in. I took a list down… I love your podcast. I’m jealous of your guests. So, you had Tony Robbins on. You’ve had Carl Richards of Behaviour Gap Fame. You’ve had Eric Clarke, founder and I think president of Orion. Massive RIA’s, Marty Bicknell of Mariner Wealth. Also had Joe Duran on I believe as well. So, a very diverse guest list of people, in our industry people, outside of our industry. Before we get to some really cool things that I’m sure over the last handful of years that you’ve pulled from this amazing guest. Why did you start the podcast up? I’m curious. [00:39:55] Steve: So after I ended up leaving Peak I had to figure out, “What am I going to do next?” And when I left Peak honestly I did know exactly what I was going to do. I mean I was so busy doing the work that I was doing there that I didn’t really have a lot of time to stop and think of, “Okay, what’s going to be my next act?” I just knew that it was time for me to go do something different. I just really felt called that it was a chapter that it kind of run its course and I was ready for the next big challenge and so I took time off thereafter I left and really tried to figure out what is it that I want to do. I had been listening to a lot of podcasts. I’ve done a lot of audio work in the past even back in my Securities America days. I remember back in the ‘90’s, it was essentially a podcast. I literally went to a guy’s basement and he had a studio in the basement with this light hanging from the ceiling that look like it was an interrogation room and we’d call people and I would interview them just like we’re doing on this show right now and this was back in the ‘90’s and I think originally it was on cassette tape and then I think we move to a CD back then. I always enjoyed the interview show, the conversation show and just talking to different people all over the place and so kind of my history of that and then also listening to podcast here back in the last few years I thought, “I’m going to do this.” It’s a way for me to continue to learn and so I call up one of my buddies, Jason Lahita, from FiComm. Jason was my first guest and I think the first show was probably kind of rough. In fact, if I remember correctly the first time we tried to record there was a lot like the air-conditioner in his office was making too much noise and so we had to figure something else out and reschedule and record it again but he was a great sport and a good friend as well. Jason was the first guest and it just snowballed from there and it’s been a lot of fun. I’ve been very fortunate to have some great guests like you said Tony Robbins who’s on a couple of times and Joe Duran, Elliot Weissbluth. A lot of good names there. [00:41:58] Brad: Why are more financial advisors not doing podcasts? [00:42:01] Steve: It’s a lot of work and you know it as well. I think you have to have a passion for it and like a lot of things in life and the society of this knowing doing gap. I think most financial advisors know what they should be doing to be more successful but they just don’t always do it and I think part of the reason why they don’t it because they’re just not that excited about it. They don’t have the internal intrinsic motivation to want to do it. So I’d say with the podcast, you really have to be curious. You really want to learn. You really want to have conversation like you and I are having here. It’s really going to be something that you enjoy and your passion about because it’s going to come through in your voice and the listeners are going to know that. So I think that’s one thing. It’s just really having an interest in it first and foremost. A second thing is to really have a, I’ll call it a possession or an angle or a point of view and that, “Why are you doing the podcast?” “How is the world going to be better as result to this podcast?” “Why should people be listening to this podcast?” “Who is the target audience for this podcast?” And so there’s going to be a reason why the world is going to benefit from you taking the time to the show so I think you really have to figure that out and if you have those two things if you have the passion and the interest for it and you have a reason to do the show that’s really going to provide some value to your target audience then I think you’ve got an opportunity to be successful. [00:43:26] Brad: Right on, spot on. I think it comes down to being a lifelong learner. I’m naturally curious and I can tell you’re obviously a life-long learner too. Honestly, I think I would do this podcast if no one listened. I have that much fun doing it. [00:43:40] Steve: And that’s how they start out. It’s like no one’s listening. [00:43:43] Brad: The good news with your podcast with Lahita no one was listening, right? [00:43:47] Brad: And noone is looking. [00:43:50] Steve: Jason was my test case. [00:43:53] Brad: I’m actually going to give him a hard time now. I’m going to be like the podcast that’s made an amazing recovery after the first episode. [00:43:58] Steve: That’s right. It shows how you can fumble the ball and still win the game. [00:44:04] Brad: Let’s go to some of your guest that you’ve had on the show and I think something that I find on mine I’m sure you do the same as you’ll have a guest on and then you kind of be thinking about the conversation and a day or two later and something will just hit you and you’re like, “Wow, I never thought about it that way” or this quote or this piece of advice was a game changer for me. I’ll give you a little bit of time to process the question but if you think back to your past guests, have there been those moments on the show were you like, “Wow, that just blew my mind” and if there are some of those I’m guessing there are. Could you share one or two and maybe who you attribute it to? [00:44:38] Brad: Let me give you one here from Tony Robbins and so I went to his “Unleash the Power Within” seminar, probably a year and half or so ago. Just a great event and like I said he was one the show a couple of times and he told a story about how back in his… when he was just a young kid and he was just basically dirt poor. And probably going to fumble the story a little bit but the jest of it is he went to a restaurant and had about $10 to his name and he saw the young person I don’t know maybe the kid was 10, 12 years old. He was there with what appeared to be like his grandmother and this young boy was being so deferential to his grandmother was opening the door, was being polite, this that the other thing. And so, what Tony decided to do was he gave basically his last $10 to this little boy because he was just so amazed that just how wonderful this little boy was to this older person. And basically the lesson that Tony was saying was he said, “If you don’t give a dime out of your dollar, you’re never going to give a million out of your 10 million.” So, he was making the point that we all have to be giving and he said “The key to living is giving.” It’s all about if you really want to have a happy life you’ve got to figure out how can you give more and it’s not just necessarily giving more money but it’s giving of time, it’s giving of your attention, it’s giving your appreciation and so that was a really powerful moment for me it’s just reinforcing the importance of being able to give regardless of how much time or money that you may have. I thought that was a great lesson. Also, Elliot Weissbluth was on the show of HighTower and he related a story that I’ve actually heard a number of years earlier and it was from Andy Grove who was the former CEO of Intel who has since passed away but he wrote a book called, “Only the Paranoids Survive” which is great. If you haven’t read it, I definitely recommend it for folks. So what Elliot said was one of the things that he does on a yearly basis is he says every December he sits down and he fires himself. And I said, “What do you mean by that?” and he said, “Well, he says I literally I take out my journal and I fire myself and then I think about okay, here are all the reasons why my board of directors fired me this year. I didn’t do this, I didn’t do that. I was too slow for this. I didn’t notice that.” There are the case may be. And then he sits back and he says, “Okay, I’m going to rehire myself now and now that I’ve rehired myself, what are all the things that I’m now going to do as the new CEO?” And so what happens here is you make a mental and the mental shift is that when I fire myself I’m sloughing off all of the legacy stuff, all the bad decisions, all the mistakes that I made, all the sunk costs that are out there. Those are gone because I fired myself. Now that I’ve rehired myself I can come in with a totally clean slate, a brand new perspective and I can essentially start things over and so I think it’s just a good mind exercise to cleanse yourself of all the baggage of the past and start fresh each year. I think the genesis of this idea as I mentioned came from Andy Grove. What Andy Grove did was maybe for the story back in the early 1980’s. Andy was having a conversation with Gordon Moore who was one of the co-founders of Intel and back in those days, Intel’s main business was memory chips and they were starting to get creamed from the Japanese because the Japanese started to flood the market with this low cost memory chips and Intel I think it lost maybe a $100,000,000, which back in those days was a lot of money. And so Grove turns to Gordon Moore and he says, “Look”, he said, “What do you think we should do?” and so this is Andy Grove saying to Gordon Moore he said, “If the board of directors fired us and hired a new CEO, what do you think the new CEO would do?” And Gordon says, “Well, I think they’d get us out in the memory chip business and they’d get us into the microprocessor business” because that was really the big decision to stay with memory chips and bet the farm on that or do we pull the plug and go into the microprocessor business. Kind of the beginning of the personal computer revolution and Moore says, “They’ll get us out of memories, they’ll move us into microprocessors.” So Andy Grove says, “Okay, why don’t we do this? Why don’t we walk downstairs, walk outside the front door, turn around, walk back in the front door and let’s just pretend that the board fired us and now we got rehired and we are the new CEO’s of the company and let’s do exactly that.” And so that’s exactly what they did and of course we know the rest of the story. Intel went on to become one of the greatest companies in the world and Andy Grove has gone down in history as one of the all-time great CEO’s. [00:49:38] Brad: I loved that story and a lot to take from that. He should’ve had that conversation with the guy running Kodak too by the way. [00:49:46] Steve: I’ll tell you lots of stories about Kodak as well. In terms of how they missed the boat and I mean maybe you know the story too back in the… I want to say it’s the 1970’s or so. Kodak had like 90% market share in the photographic film business. Just on top of the world and then of course by 2012 the company had declared bankruptcy and then you’ve got a company like Instagram that had 13 employees and they got bought by Facebook for about a billion dollars with 13 employees. And of course the ironic thing about who invented the digital camera. [00:50:24] Steve: Kodak! And they invented it like in 1976. [00:50:28] Brad: You know it’s funny as it’s that exact conversation, Intel saw where it was going but Kodak was too stubborn to get away from what their bread and butter was to go to where their market was going. [00:50:40] Steve: Right, they got too cushy and they didn’t really have a good understanding of what business they were really in and so they didn’t make the shift. They just kind of milk the cash cow for too long and by then it was too late to make that shift and so of course they’re kind of the poster child for this idea of being disrupted. I maybe wrong about this but I’m thinking that it is probably going to be harder to disrupt companies today than it was 30 years ago because there is so much more communication today. They’re so much more awareness of this business idea that I can’t get disrupted or I’ve got to disrupt myself and so you’ve seen some of this larger companies like here in our industry. You look at some of our companies. The big companies are still staying big and they’re getting bigger like in Envestnet for example. I had Jud Bergman, the founder, co-founder of Envestnet on the podcast and if anybody is going to get disrupted you might think it’d be Envestnet because here’s a company that got started back in about 2000 with some legacy technology systems and now we’ve got all these up start technology firms so what does an Envestnet do and this is a credit to their management. They’re acquiring in these firms and they’re integrating them into their platforms so rather than actually necessarily building some of these new technology. They’re just acquiring it so I think that’s what a lot of companies are going to be doing these days as rather than getting disrupted. I think most of them have smart enough management that they are actually either building it themselves or they’re acquiring the firms and integrating it. [00:52:12] Brad: I think what’s’ interesting too about your point on companies being tougher to disrupt, I look at my iPhone here… It’s like android would have to put out a phone that is a hundred times better than an iPhone before I leave all of my stuff, all of my apps that I’ve invested in. All of the technology that is now basically my life’s embedded on the iPhone, right? And so going back to financial services as technology starts to creep in and as clients get very comfortable with having all of their apps or tools right there where they have full access to them. You’re going to have to start to become a much better financial advisor to get them to shift platforms I think as time goes on. [00:53:26] Brad: Amazon’s threw a lot of money at trying to be a third player and that just fell flat on its face. [00:53:31] Steve: And look at Amazon, oh my gosh. They’re in every freakin’ business there is. They’re just almost unstoppable it seems. [00:53:39] Brad: Before we move on to kind of the last set of questions to throw at you, any other guests that you want to throw any advice that hit home with you that you think would benefit financial advisors listening out there? [00:53:50] Steve: You know a lot of them. Another one Joe Duran for example, I’ve had an opportunity to work closely with him for awhile and know him pretty well, great guy and one of the things he said that I think is instructive for all of us is that the more valuable you are to the business, the less valuable the business is. And so as we talked about this idea as you’re building a business, do you want to be a CEO of the business or you just want to be an advisor. So if you do want to build a large business then you have to make sure that the business relies less and less on you actually providing service and surrounding yourself with the most important people and I think that is another key thing that comes through in many of the podcasts that I do is just the importance of surrounding yourself with the right people. When I have a coaching engagement invariably there is a people problem at the company. Either they’ve got someone on the team that shouldn’t be there or their short staff or somebody quits unexpectedly. There’s always an issue related to the people and I think that is such a key thing that the growth of your business will be limited by or will grow by your ability to surround yourself with incredible people. So I can’t stress enough the importance of surrounding yourself with absolutely the best people you possibly can and you have to continue to improve that. I think about back in the early days of Peak and I think about all the people that we went through to get the point where we really had an amazing team and as the company grew we were able to get higher and higher quality people and I would always tell the team I said when we’re having an interview with someone afterwards we regroup and have a conversation internally about what would we think of this candidate and often times I would say, “Okay, is this person a significant step up from the person that they’re replacing?” because we always want to make sure that the next person that we hire is demonstrably better than the person that they’re replacing so that we can continue to improve the quality of the organization. [00:56:02] Brad: You’re reminding me of a piece of advice kind of a mindset shift one of our top clients had. This is a guy that I think last year captured more than three hundred million of new assets. This wasn’t acquiring firm. These were new assets coming through the door and he said one of his biggest mindset shift when it came to building his firm was and I see this as a common theme in financial services. It’s this constantly, “Oh, I should hire this person six months ago” so now you’re in this rush. You’re rush interviews. You’re trying to find the candidate because everybody is overworked. You’re under staff. And he said, “I forget who we got this advice from but it was somebody that had built a massive organization” and he said, “Have you ever thought about shifting to the mindset that you’re constantly hiring, right? You are a firm… essentially every year you’re trying to do this this kind of hockey stick like growth. Why do you ever stop hiring? Are you ever trying to not look for amazing talent? Why wouldn’t you just keep that door open so people can constantly come in and you can continue to take those hires and the direction you want your firm to go. And he said just that piece of advice, it was the simplest advice in the world but it did me so much good because I was constantly trying to play catch up in my hiring process. [00:57:14] Steve: Well, two thoughts come to mind on that. One is that you should always have a short list of people that you would want to hire so even if you’re not technically on the market to hire someone right now you should always be networking. You should always be keeping your eyes and ears open for a great person where you’d say, “You know someday I’m going to have a need for someone like that and I’m going to keep that person on my radar. I’m going to stay in touch with them if you already know them.” But always have kind of a short list of people that you know you’d reach out to right away if that opportunity arises or if they come on the market I mean I used to work for a company before I got in this industry. It was a subsidiary of American Express and I didn’t really understand it at the time but they had several different businesses and they would have this 35-year old guys and they were mostly guys back then who are the CEO’s of these business units and then something would happen and that CEO would no longer be the CEO and then they would just kind of like put them on the bench. And where they just would just be off to the sideline and I’m thinking to myself, “What are these guys doing?” You know they’re making a boatload of money and they’re not really doing anything. Well, I didn’t realize it at that time but as I look back on it I realized what was happening is you know they were kind of in reserve. And so there were so many opportunities as the organizations were growing that well this guy may have left company A because of whatever reason. They were just kind of biting their time until the next opportunity arose because they know this is still a good guy that we want to keep around. So they were always keeping that bench really strong and I think that’s something that financial advisors can think about. I know that’s a real luxury in probably most firms don’t have the luxury of keeping someone on a bench I mean that doesn’t make sense for companies the size that you and I typically work with. But the idea of always having a short list of people that you can reach out to when that opportunity arises I think is good. The second thing is and this is something that comes from my good friend Mark Moses who I know you’ve had on your podcast as well. One of the things that Mark said was the question that he likes to ask is, “When was the last time you fired someone too soon?” and the answer is never. And so he said, “The longest time in an entrepreneur’s life is the time between when they decide to let someone go and when they actually let them go.” And I have experienced that as well where I’ve had to fire people overtime. It’s no fun but what I ultimately realized was if it’s not working out for me, it’s not working out for them either. And so the most humane thing to do is when you have decided that this person is no longer working out and you know you’ve given all the opportunities so on and so forth but clearly this person is not going to be a long timer here. Once you’ve made that decision you know you got to let them go and you need to do it in a humane way and while you may feel bad about it ultimately 9 times out of 10 they’re going to end up in a better situation because again, if it’s not working for me, it’s not working for them. Most people we get comfortable, we like to stay in that comfort zone and so we’re not going to just voluntarily leave a situation unless it’s really bad because the fear of the unknown often times is greater than the unhappiness that we do know. Sometimes you just have to get people that pushed, that shove to get out there, to force them to get out of their comfort zone, to force them to go find a new opportunity and they’re going to be better off so I just think that’s an important thing to keep in mind is don’t keep people on your team that should not be there. It’s going to be miserable for you. It’s going to be miserable for them. It’s going to be bad for the business. It’s going to be bad for your client. So once you make that decision, move fast, get it done. [01:01:00] Brad: And that’s so hard for financial advisors. I mean it’s hard for everyone but I see it over and over again where they know that that individual is not working. And I think it’s because typically a lot of offices I mean these aren’t massive organizations they’re maybe 10, 15, 20 people firms I mean that’s if they’re starting to gather some real assets. So I just think it’s really tough. I did a little mental trick I got from Darren Hardy that we did a private coaching session with him. He’ll actually ask he’ll say if Joe Smith came and sat down for an interview today and reinterviewed for their position, would you hire them? If there’s even hesitation there a lot of time she’d know what the correct answer is. Probably somewhere else is a better fit for them. [01:01:46] Steve: Absolutely, yeah. We’ve used that question before as well. Just asking yourself. Knowing what I know now about this person, they’d been with me for five years. Knowing what I know about them now, would I rehire them for this position? So that’s a great question for sure. [01:01:59] Brad: Alright, Steve. Let’s transition. Are you ready for some rapid fire questions here? [01:02:03] Steve: Well, hopefully I’ve had enough caffeine today. [01:02:06] Brad: We’re from the Midwest so we talk a little slower so they might not be quite as rapid fire. Alright, so the first one I’d like to throw at you, when you hear the word successful who’s the first person you think of and why? [01:02:18] Steve: Well, I don’t want this to sound like a cap out I mean I think of my Dad and as I mentioned earlier there’s this guy who retired in his late 50’s and never worked another day in his life in terms of paid work yet I think he’d say that he’s really enjoyed his retirement years. He’s done what he wanted to do and so to me you know I look at people that are successful I think of people that are doing what they want to do. They’re around the people that they wanted to be around and they’re kind of living life the way they want. It doesn’t necessarily mean they’ve got a boat load of money but they’re just happy with who they are. They’re happy with what they’re doing. They’re enjoying people and to me that would be kind of the definition of success. [01:02:58] Brad: With your Dad, do you think that he went into retirement with the intentional thought process of here’s exactly what I want to do in retirement or did he just let it come to him and he was comfortable with whatever happened I mean, was there something that made it a successful retirement in your opinion from just watching from the outside? [01:03:18] Steve: I’m not sure how intentional it was. I think in the last few years of his career it got moved around a little bit. He took an early retirement a buyout thing. So I don’t think in his last few years of his work that he had the kind of passion for what he does that I have and that you have for the work that you do I mean we love what we do. I mean I can’t envision a time when I’m going to stop doing this kind of stuff and like you said you’d still do a podcast even if nobody listen to it. Just because you enjoyed doing it you love to learn. I think overtime he found what he liked to do and he was very fortunate. Both my Mom and Dad are very fortunate and that they have had life-long friends in Omaha that they got together with on a regular basis and unfortunately now two of my Dad’s very very best friends, life-long friends had passed away in the past year and a half or so. So that you know it’s hard on them at this point in their lives given their age but definitely for the first couple of decades of their retirement I think they’ve enjoyed themselves and my Dad found ways I think the internet so two things: one is the internet. My dad loves the internet because he saw in the internet reading all the business news and everything in CNBC. I mean I don’t know where he’d be without CNBC and then my Mom I was just visiting both of them a couple weeks ago in Omaha and my Mom says, I don’t know what I do without Netflix and her iPad. Her eyesight’s getting bad and yet she can still watch all of her shows on her iPad and Netflix. Technology has helped there. [01:04:50] Brad: Love it. Hey, we’re in a good spot. I think we can keep podcasting till we’re at least 87 or 90. [01:04:56] Steve: I think so. As long as we can still speak. [01:04:59] Brad: As long as the mental capacity is still there. [01:05:02] Steve: We might have to turn the camera off. [01:05:05] Brad: What is your favourite book you’ve ever read and why? [01:05:10] Steve: So many. One book that I think sticks out would be called, “The Soul of Money” and it was written by Lynne Twist and gosh it must go back maybe 20 years or so and it really talked about the spiritual side of money and as I talk about this idea of Return on Life versus Return on Investment. I’m really interested in kind of the deeper aspects of money and I’ve been around and I’ve worked with a lot of really wealthy people. And it’s just interesting to see what money does to people both good and bad. I’m fascinated by that and so I really try and understand a little deeper meaning of what money is, what it does and this book, The Soul of Money by Lynne Twist I think is a really good one and I definitely encourage advisors to listen to that or to read it. [01:06:04] Brad: There’s a study, you probably know it, I just remember I read it somewhere. Somehow they were monitoring the mental pattern or the brain wave patterns of people when they purchased something for themselves and when they gave money away to purchase something for someone else and just going to back how can you use this money and what’s the purpose of life and everything behind it that. It was like explosions went off when you gave money away for someone else as oppose to when you purchased something for yourself. It was this instinct gratification of dopamine and then it went away. It’s just really interesting. I’m intrigued by that too. [01:06:41] Steve: In Omaha, there was a fastfood restaurant there and every so often when I go there the person at the payment area there for the drive up would say, “Would you like to give $2 for the Madonna school?” which was this organization in Omaha that I think it helped unwed, low income mothers who needed a place to go. What I would always do is I’d give him a $20 bill and I said for the next eight people or whatever they come by that say, “No, I don’t want to give money to the Madonna school.” I just want you to say well someone has given some extra money and they’re going to make a donation on your behalf and it’s funny because the person that I said this to at the checkout lane there at the fast food they would just go nuts. I mean they call come over here and they get the other people from the cooks and come on over you know this gentleman look what he did you know this is so cool. One time I did it that same person was there and I did the same thing and she looked at me she goes, “Oh! You’re that guy. You did this before, did you?” It’s just this little things that it can have such a big impact and it doesn’t have to be big amount of money I mean it could be $2. It could be $5. It could be opening the door for somebody. It could be smiling at somebody. Those are things that are not expensive and it is just so true that we can have a much better life if we just focus on how much more we can give and just help people that’s we’re really helping ourselves ultimately when we do that. [01:08:23] Steve: Wish List number. [01:08:25] Brad: Yes, see? You’re on the cutting edge of all technology. Stu is I met him through Michael Hyatt and just an incredible person. Him and his wife started charity over in Africa where they build schools for children that need them. But anyway, he shared this amazing idea with me and it’s basically your secret shopper where you anonymously buy groceries for people and I was looking for an idea. I’ve got six-year old, a five-year old and 1-year old now and I just wanted to instill the sense of giving in to my children and it’s not the easiest thing to do, right? You have to come up with some fun kind of activities and I was like, “Stu, that’s a perfect idea. I’m going to do that with my kids.” And that he did it with his daughter and I don’t know where he got the idea but I will tell you, I don’t think I’ve had a higher high than sitting there. So the secret is, you give them an envelope of cash and of course the cashiers have to be on it, right? And you say whoever I stay behind in line we’re anonymously buying their groceries and it’s just amazing and my boys they’re sitting in there like all excited. Just speaking to that, I get more joy out of that than anything in the world. We tried to do that around the holidays completely anonymous. So I guess I’m blowing my cover here but the key is completely anonymous to where you don’t have to take any credit whatsoever and going back to the staff getting incredibly excited, it’s like the best day ever for the grocery store workers because they’re having so much with it. They’re like sitting there, there and on it just as much as you are and you’ll have to try the grocery store idea, Steve. [01:10:06] Steve: Well, and I haven’t shared this before and I feel horrible about this but right along with that example I remember a time when I was at the checkout line and there’s a person in front of me trying to buy something and they didn’t have enough money to buy it and I thought to myself, I should just do it and I didn’t and you just reminded me of that and I still feel guilty about it to this day that I just didn’t whip out a few dollars and say, oh hey, girl take care of it. It’s the little things like that that I think it just goes such a long way and really brighten people’s day. In this day and age, in this country, this world that we live in that is so divisive I think if we can get more people doing this little Random Acts of Kindness whatever you want to call it I think those are things that we really you know if we can do more of those I think that’ll go a long way toward helping us all get along a little bit better here. [01:11:01] Brad: I completely agree. It’s something I’ve tried to do more and more of and we’re all in the spot where we’re fortunate enough that you can pass on some of the success and gains onto others that’s it’s going to make a massive impact for them. Thanks for sharing that. That’s inspiring. Actually, I’m going to go to the last question and that we right at the stop time here. And I got this from your buddy, Ron Carson by the way. And I think this came from Habits of Top Achievers so you might have actually written this question. So, knowing obviously that this is an audience of financial advisors, what is the one piece of advice that’s lead to your success that you could share with all the advisors listening to the show today? I would just say to everyone listening that I did that at age 50. I kind of gave up something terrific to try something new because I’d feel that it is so important for people to continue the challenge themselves. To continue pushing those edges to try and find where those edges are and to not let fear cause you to turn inward and not allow you to really fully give the gifts that you have. I’m still a working progress. I mean I’m 55 now so it’s been about five years since then and I couldn’t be happier. I’m thrilled that I made the decisions that I made and continue to push myself whether it’s starting a podcast which is stuffing out of my comfort zone or starting a new business or trying to make a sale whatever it is. I just think it’s important for us to you know, if you want to have a satisfying life, just keep pushing those boundaries. Try to understand what you fear and move forward, do it anyway and it’s not going to kill you usually. I like to climb mountains and one of the reasons why I do that is I just like going out once a year and really doing something that is totally different from my day to day life. I’m hearing Wisconsin is pretty flat here. I get out in the mountains. I’m in a tent. Everything that I need to survive I carry on my back. It just really makes you understand that ultimately we don’t really need a whole lot to survive. We need some food. We need some clothing. We need some shelter. You know kind of those basic necessities. So it helps you really stay grounded but it really pushes you out into that barrier. So I think that’s important for people just keep pushing yourself and don’t let fear stop you short of what you’re totally capable of doing. [01:14:53] Brad: Awesome advice. Well Steve, I want to say thank you. It’s fun to going way back when I was literally a rookie in this industry. Remember seeing you from stage and sharing a lot of Tested in the Trenches methodology. It’s really fun to fast forward and really see where your business has gone or our business has gone and I just want to say thank you for being a champion for our industry. You’ve been a trendsetter in many ways and I want to say thank you for the work you’ve done for the advisors out there and in turn their clients you’ve made the world a better place for both of them. So thank you for coming on and sharing with us. [01:15:26] Steve: Well, I appreciate that Brad and I thank you for what you’re doing. Your podcast is awesome and you’re likely in many ways. You’re out trying to make things better and share good messages out there and help other people improve. So I appreciate all that you do as well. [01:15:39] Brad: Alright Steve, take care! Thank you.